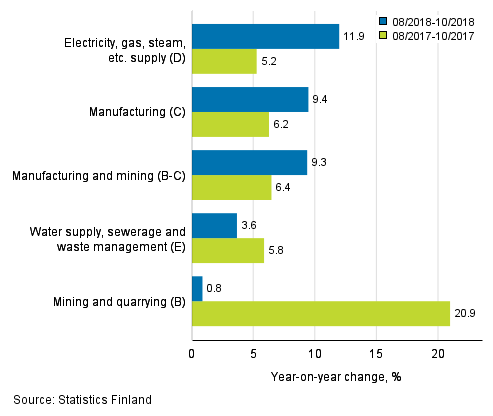 According to Statistics Finland, turnover in manufacturing in the August to October period was 9.4 per cent higher than in the corresponding period of the year before. Domestic sales grew by 5.3 per cent and export turnover by 12.5 per cent from one year ago. Turnover went up from the corresponding period of the previous year in all manufacturing (C) sub-industries . Growth was strongest in the chemical industry, 18.4 per cent, and in the electrical and electronics industry, 14.0 per cent. The slowest growth was recorded in the textile, clothing and leather industry, 0.6 per cent, and in the food industry, 1.4 per cent. The turnover of all main categories of manufacturing industries grew year-on-year. Turnover growth was strongest in the industry of electricity, gas, steam and air conditioning supply, 11.9 per cent. Turnover in water supply, sewerage, waste management and remediation activities increased by 3.6 per cent, and in mining and quarrying by 0.8 per cent compared with the previous year. Starting from this statistical release the latest industries defined by the Business Register have been taken into use in the turnover and wage and salary indices. 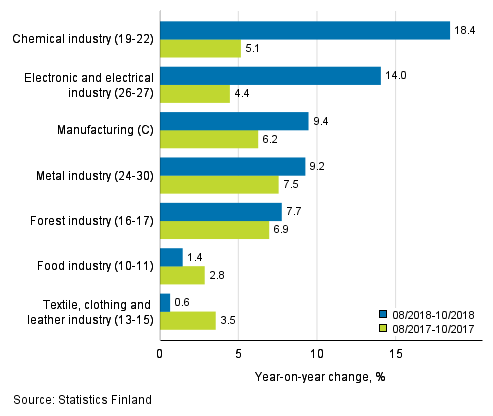 The industry corrections are visible as revised data in some of the published industries for the years 2017–2018. The effects of the changes are taken into consideration in statistics production so that no breaks occur in the time series of the published index series. The interpretation of the statistics also remains unchanged in the renewal. Revisions to annual changes in industries are presented under Revisions in these statistics. ISSN=1798-596X. October 2018. Helsinki: Statistics Finland [referred: 18.4.2019].